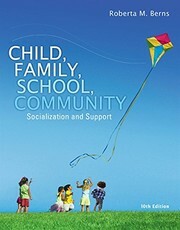 The best-selling CHILD, FAMILY, SCHOOL, COMMUNITY: SOCIALIZATION AND SUPPORT, now in its Tenth Edition, offers an excellent introduction to socialization that is grounded in a powerful conceptual framework-Urie Bronfenbrenner's Bioecological Model of Human Development. Examining how the school, family, and community influence children's socialization, this text addresses complex issues in a clear, comprehensive fashion. Students enjoy reading the book and appreciate its narrative drive, meaningful and timely examples, and effective pedagogy. A sensitive and robust presentation of diversity issues includes matters related to culture, ethnicity, gender, sexual orientation, socioeconomic status and special needs. Updated throughout, this edition features a strong emphasis on NAEYC and NASW standards as well as a new neuroscience feature called Brain Briefs. Important Notice: Media content referenced within the product description or the product text may not be available in the ebook version. 978-1305088979 PDF is available as a free download.